If you knew how many cinnamon rolls are eaten at my house on a weekly basis, you would fall over backwards. It’s crazy! My husband is a huge fan of sweets and we used to buy them at the grocery store every week with the rest of our groceries. 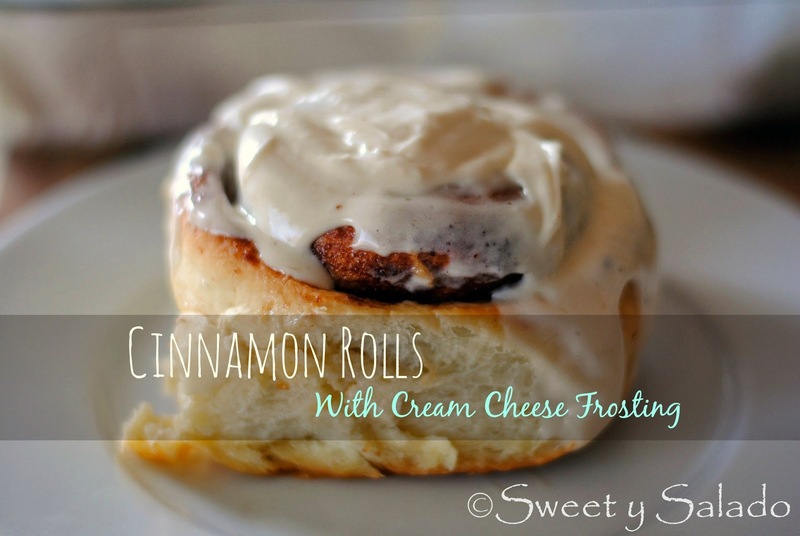 They were actually pretty delicious, incredibly soft with lots of cinnamon and the cream cheese frosting was amazing. Then, the unthinkable happened and they turned out awful all of a sudden. I don’t know what happened, maybe they changed the recipe, got a new baker, fired the old one, don’t know. Bottom line is, they sucked and still do. So, we had to change our strategy and then started getting the ones you get in a can. You know the ones I’m talking about, the ones you pop open, bake for a few minutes and then frost with whatever frosting they come with. Well, I know many of you love them but we just couldn’t get to like them at all. The texture is weird, the frosting is too sweet and if you don’t eat them as soon as you get them out of the oven, they get hard as a rock. And that’s when I decided to just make them myself. Of course, this was no easy task because we’re pretty tough when it comes to grading any kind of cinnamon rolls. I tried all kinds of recipes, famous and not so famous, with different types of frosting, different amounts of cinnamon, you name it. And then one day I finally figured out a recipe that makes the most incredible cinnamon rolls with a fantastic frosting. The best part is I can individually wrap them, put them in the freezer and every time I heat them in the microwave, they come out as if they were freshly baked. No more store bought rolls for us! 1. Mix milk, dry yeast and ¼ tsp of white sugar in a small container and let it stand for about 5-8 minutes or until a foam forms on top indicating that the yeast is activated. 4. Make a well in the center and add the yeast and egg mixture. Start mixing with the mixer’s dough hook at low speed, then increase to medium speed and let it work the dough for about 5-8 minutes or until the dough is smooth and elastic. 4. Make a well in the center and add the yeast and egg mixture. Stir with a wooden spoon until the dough is sticky and pulls away from the sides of the bowl. Place the dough on a flat, floured surface and knead by hand for about 5-8 minutes. **To knead the dough, fold it over and push down with the heel of your hand. Repeat this process during the entire kneading time. The dough is ready when it is smooth and elastic. 6. Shape dough into a ball and place it into the greased bowl. Cover with plastic wrap and let it rise in a warm place for about 1½ hour. **Tip: You can turn on a microwave for about 1 minute to warm it up and then place the dough inside. This will help it rise better. 7. In a small bowl mix the brown sugar and cinnamon. Set aside. 8. Once the dough has doubled in size, gently punch it with your hand and roll it flat with a rolling pin into a 12 x 14 inch (30 x 35 cm) rectangle on a floured surface. Make sure the longer side is facing you. 9. Spread the butter over the dough with an offset spatula and then sprinkle the cinnamon sugar over the dough leaving about 1 inch (2.5 cm) from the border of the long side that is away from you. Gently press it with the rolling pin so that it sticks firmly to the dough. 10. Roll the dough tightly starting with the long side facing you and ending on the long side that is away from you. 11. Cut the roll into 6 equal size rolls with a serrated or sharp knife and place them on a 9 x 13 inch (23 x 33 cm) baking pan that has been lined with parchment paper. You can also cut the roll into 10-12 smaller rolls. 12. Cover the rolls loosely with plastic wrap and let the rolls rise in a warm place for about 1 hour. **You can use the microwave method to help them rise. 13. Once the rolls have doubled in size, bake them at 350ºF (180ºC) for about 30-35 minutes or until golden brown. Let them cool a bit while you make the frosting. 14. To make the frosting beat the cream cheese and butter in a medium bowl until light and fluffy, about 2-3 minutes. 15. Then, add vanilla and salt and mix for another 2-3 minutes. 16. Add ½ the amount of powder sugar and start mixing on low, raise the speed to high and mix for 2-3 minutes. Then, add the remaining sugar and beat 2-3 more minutes. Make sure to scrape the sides of the bowl to incorporate all of the sugar into the frosting. 17. 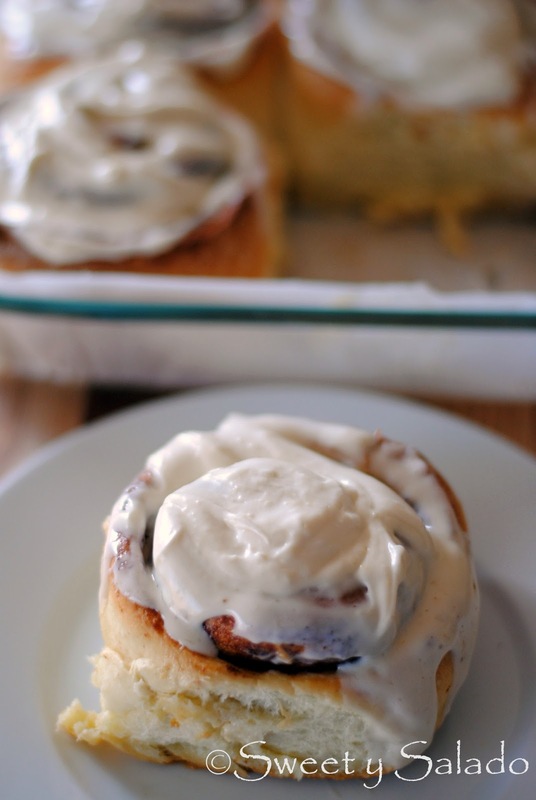 Spread the frosting over the warm rolls and serve. **Note: To freeze the rolls, you can let them cool completely after they have been frosted, wrap each roll individually with plastic wrap and freeze them for up to 6 weeks. To defrost, simply unwrap them and heat them in the microwave for a few seconds until warm. Hi, I followed your recipe . The whole dough is very runny! it cannot works! Why? Hi Vanessa, I think the problem has to do with your measurements because this recipe has triple the amount of flour vs. the amount of liquid, so that's why it can't be runny. It is a bit sticky because of the sugar but that goes away after you knead it for while. Make sure you're using measuring cups or a food scale to measure every single ingredient and you'll see that you'll end up with a beautiful dough. My rolls r tough after a day. May I know what went wrong? There could be a few reasons. The main one could be because the yeast was not activated correctly and therefore, the gluten in the dough did not develop the way it should. It could also be because the dough was not let to rest in a warm place so it could double in size, this also lets the gluten relax giving you a soft bread roll. When the gluten is not relaxed and it's still tight, it gives you a tougher dough. You also need to store them in an airtight container so air doesn't dry them out because it will also harden them since they don't have any preservatives.